We love the aroma, flavor and unique preparation style of good quality Vietnamese coffee. It's pure arabica, just slightly lighter than a French roast, and smooth not acidic. The premium quality coffee is grown and roasted in Vietnam, and ground to the appropriate coarseness, so you know you're getting the real thing. It's also vacuum packed in a modern can. Preparing delicious Vietnamese coffee is quick, easy and doesn't require much clean-up afterward. The coffee filter has three parts (filter, screw-on damper, and lid). Simply place the filter on top of a cup, so it looks like a hat. Add 2-3 teaspoons of coffee to the filter, then screw on the damper so it's snug (not tight). Shake the filter a bit to settle the coffee. Fill up the cup about 1/3 with hot water then wait 20 seconds. Unscrew the damper 2 turns and fill the cup entirely with hot water. Place the lid on and wait a few minutes until the water has dripped though. Add a spoonful (or more) of sweetened condensed milk to the cup before or after you start the process. The final result is fabulous. Printed instructions come with the filter. The filter set is stainless steel--it will last for years. 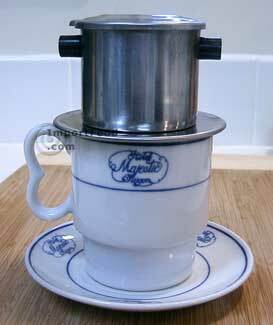 "I recently ordered a Vietnamese coffee filter set and a can of Trung Nguyen Vietnamese coffee. I was happily surprised to receive it the next day, and have been enjoying it ever since. I will order a second set in the near future, and will happily do business with your company again." We also offer the traditional, unique Thai iced coffee drink known as "oleang" which is a blend of coffee, sesame and corn. Thai Coffee: for complete preparation instructions, click here.